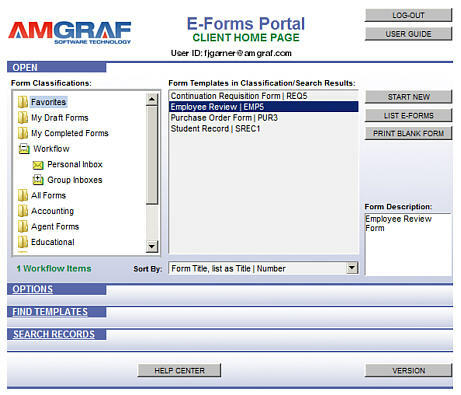 The best way for an organization to manage client access to a large repository of electronic forms is with the Amgraf Forms Portal. 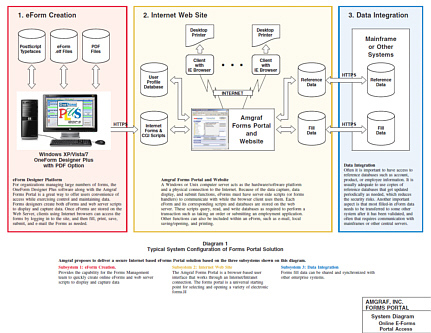 The forms portal is a browser-based user interface that works through an Internet or Intranet connection. The forms portal is a universal starting point for selecting and opening a variety of electronic forms. It gives users a convenient place to store database-connected OneForm HTML forms, as well as fillable Adobe PDF forms. Contact Amgraf today for a free UserID to test the Forms Portal. The Internet-based forms repository is available 24/7 around the clock. Online forms are organized by their Purpose (or Status) within Form Classification folders. Most e-forms are filled using standard HTML. E-forms are always printed and emailed as PDF. Action buttons to Print a Blank form, Start Filling a New Form, and List/Print/Export filled-in forms. Every finalized e-form creates a searchable database record. The Search Records button shows a list of e-form that match. The e-forms can be copied and printed, or the list can be exported as a spreadsheet. Digital photos and other images can be inserted into e-form graphic fields. External files can be attached and saved along with a filled-in e-form record. There is also an optional integrated Sketch tool is ideal for making and modifying simple drawings for merging into e-forms. E-form input fields have real-time keystroke validation. Dropdown select lists can be dynamically populated from database tables. All date fields have a pop-up calendar for convenience. Sometimes e-forms cannot be completed in one session, so there is a Save Draft button to preserve work-in-progress. Sometime it is necessary for more than one person to be involved when filling out a form. Some forms also need to be approved before a report can be finalized. The Forms Portal supports this kind of online collaboration through Simple Workflow. Clients can send a partially finished e-form to a specific portal user, or to a group inbox that is shared by many users. Forms that can be selected, opened, and printed. These can be opened, filled out, and then printed. OneForm e-forms that can be opened, filled out on-screen, submitted (with fill data stored in a database table record), reopened for editing, routed via email, and printed on a local printer. Forms are classified in a variety of ways, usually by department or function. This allows forms to be grouped by use and made easier to locate. Classifications are determined by the Portal Administrator and assigned to a form before it is placed on the hosting server. The Start New button opens the selected form in the browser and makes it available for Client input as defined in the specific form. The List E-Forms button allows a Client to reopen e-forms that have been previously filled out and Saved as Draft. Once opened, the form data can be modified and saved again. The e-forms are displayed between top and bottom frames. The top frame is used to navigate from page to page within the e-form by clicking a Page Number tab icon. The bottom frame has a row of control buttons that allow the Client to submit the filled e-form. Clients are not allowed to save a blank form as a data record. Pre-defined workflows can be embedded into the e-forms design using OneForm Designer Plus. The Forms Portal also supports Simple (ad-hoc) Workflow to allow Clients to notify other Clients that an e-form has been submitted for review, or for further filling by other users. Workflow occurs by directly contacting one (or more) specific Client UserID, or by depositing an e-form into a shared inbox. When a Client logs into the Forms Portal, they receive a message if workflow items are waiting for them.